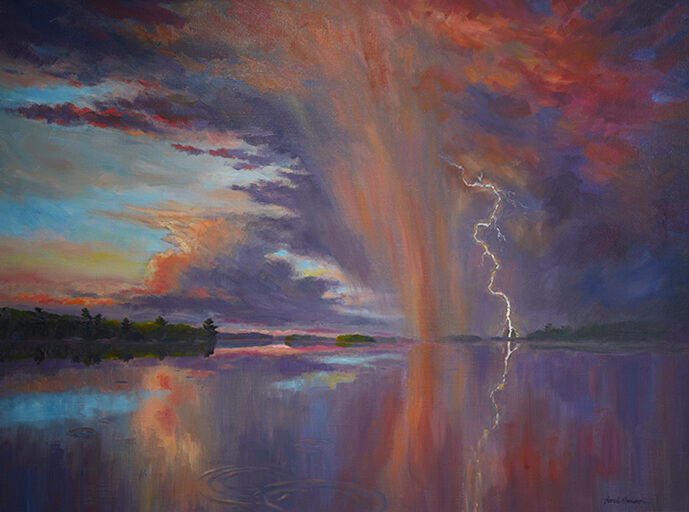 “From my many travels in the North Country, with all of its manifestations of moods across the Summer seasons, this painting contrasts a spectrum of experiences in one. Such a combined scene I have witnessed on many occasions where the storm, though retreating, demands respect through reverberating stillness. Its merciless power is evident. Dissipating clouds give way to clear skies as evening light diminishes. A golden sunset briefly emerges to highlight a last look on what was. Tranquility regains its position, returning order after chaos. Peace.